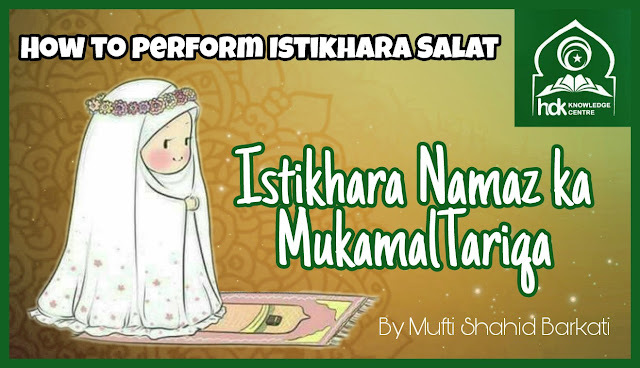 How to perform Istikhara Namaz with Istikhara Dua? It has been quoted in the Hadiths that when a person makes an intention for something then he should pray two Rakats Nafl. In the first Rakat after Alhamdo pray 'QuI Yaa Ayyuhal Kafiroon' and in the second Rakat after Alhamdo pray 'QuI Huwallaho Ahad' and then pray the following Dua and with Wuzu face the Qibla and go to sleep. At the beginning of the Dua and at the end, pray Sureh Fathiha and Durood Sharif. "Allahumma innee astakheeroka be-ilmeka wa astaqderoka be-qudrateka wa as-aluka min fadleka al-Azeeme fa-innaka taqderu wa laa aqderu wa ta-lamu wa laa aa-lamu wa anta allamu al-guyoob. Allahumma in kunta ta-lamu anna haza al-amra khairun lee fee deenee wa ma-aashee wa aa-qebate amree faqdurhu lee wa yasserhu lee summa barek lee feehe wa in kunta ta-lamu anna haza al-amra sharrun lee fee deenee wa ma-aashee wa aa-qebate amree fasrifhu annee wasrifnee anhu waqdur leya al-khaira haysu kaana summa ardhinee behe." The time for Istkharah lasts up to the time one’s heart gets convinced upon one decision. When should Istikhara be done ? 1) There is no Istikhara for pious actions such as Hajj, Jihad etc. However, you can perform Istikhara to designate a fixed time for them [Guniya]. 2) It is better to perform Istakhara at least seven times and then see wherever your conscience is fixed that is what is best for you. Many pious Buzrukhs say that if you see whiteness or greenery in your dreams then it is good and if you see darkness or redness then it is a bad thing and you should stay away from it [Radd-ul-Mohtar].